Submitted by TonyYates on Tue, 05/02/2013 - 16:00.
new list of Micro-car and related Events for 2013 has been published (click on Diary link above). Some of the entries in these listings are a bit vague — no info yet on Messerschmitt Rally in Germany, or other German events; Swedish, Finnish or Belgium Rallies; Scots and East Anglia. A few are long running annual events that we anticipate but for which we have not yet received details, others are one-offs for which organisation is still being worked out. Obviously if you are involved in organising any events that would interest MEC members then please let us know (e-mail takeoff@messerschmittclub.org or send to Mark or Alan). Submitted by TonyYates on Tue, 22/01/2013 - 13:29.
he Messerschmitt Enthusiasts' Club have been invited to attend the annual, charity, Abingdon Air & Country Show, taking place on Sunday 5th May 2013 at Abingdon Airfield (Dalton Barracks), Oxfordshire. The day includes an Airshow with a Country Show element, added. The organisers raise money for the local, Thames Valley & Chiltern Air Ambulance Trust and have raised over £30K supporting them since 2007. Submitted by TonyYates on Fri, 28/12/2012 - 14:50.
nd there you were, thinking the Christmas and New Year festivities were all over and done with... Well they aren't 'cos it's… Nosh Time! As usual we are aiming to gather at the ‘Ye Olde Leathern Bottel' Lewknor (on the borders of Oxfordshire and Buckinghamshire) at lunchtime, on Sunday 13th January 2013. Submitted by TonyYates on Fri, 28/12/2012 - 13:04.
number of you have already commented on the absence of TAKE-OFF since the last issue was published at the beginning of May. Our regular Editor and Web-site Administrator, Mark Hindell, has been involved in a somewhat drawn-out house move during the second part of 2012 and has not been able to undertake the slightly time-consuming task of assembling material both for KaRoscene as well as TAKE-OFF. Despite his very best intentions, our Chairman, who took on the task of Guest Editor, has failed to fill Mark's shoes. In order to assist Mark, who feels that he is unable to commit sufficient time to his Club duties for the foreseeable future, we are looking for a Content Editor. Submitted by TonyYates on Sat, 14/07/2012 - 16:15. Recreatiecentrum "De Schatberg", Midden Peelweg 5, 5975 MZ SEVENUM. The Dutch Micrcocar Rally is an extremely well organised event with a busy programme of activities and an emphasis on using your car. If you only ever go to one event in Europe, this has to be it! Submitted by MarkHindell on Wed, 16/05/2012 - 12:31.
awd, that was a slog! It's been a busy couple of months at the Hindell household (moving house, building works etc.) 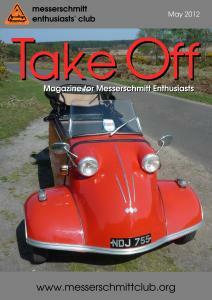 and I'm afraid time for Messerschmitts generally and Take Off in particular has been hard to come by, with the effect that what was intended to be the April issue has, like last year, slid back to May. However, the paper copies are now back from the printers and will hopefully go into the post this evening. The bad news is that my current overload of projects isn't likely to ease for another few months, so editing duties are likely to continue to get lost in the stack. However, your gallant chairman (Tony) has sort of agreed (I only had to hurt him a little bit) to return to the editor's chair and give it a crack, and I'll try to lend a hand with the production and layout work as and when required. If there are any MEC members who fancy getting into the magazine/website publishing game (it's fun, honest!) then please let me know — any offers would be much appreciated. Submitted by PeterDarby on Sat, 11/02/2012 - 11:12.
ummaging around in a "Selling Reclaimed Goods Centre" I came across a Dutch Barn shop canopy with "Panasonic" on the cover. One frame was bent in half but the other was OK. A deal was struck of exchange for an old cupboard and cash. Home we came with our prize and a lot of plans. 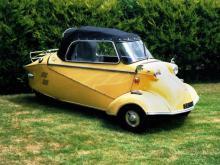 The idea of this canopy was to make a cover for the Messerschmitt that could be folded back against the wall and then taken off without moving the car. It also had to be movable in a folded state if the location needed changing. Submitted by PeterDarby on Wed, 23/11/2011 - 13:37.
hile trawling around a North London auto-jumble in boiling hot sunshine (if you can remember such a day) with my Bond T-shirt on, I got into conversation with a stallholder (as you do)! The stallholder seemed to be sizing me up for a sale. Well, he was — he wanted to sell me a bubblecar that he had bought to rebuild some time previous. He had not had time to start the rebuild and during that time the engine was stored safely in the bedroom. Came the day that his wife tripped over the engine and he was given strict instructions to either build it or sell it but to get the engine out of the bedroom! He decided he could not rebuild it himself due to ill health so he decided to try to sell it at the auto-jumble. 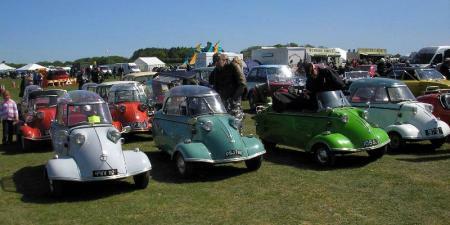 Submitted by MarkHindell on Mon, 05/09/2011 - 21:49.
he National Microcar Rally was hosted by the Bug Club and returned to the Atwell-Wilson Motor Museum in Calne in Wiltshire, and with the weather around much of the rest of the country being, in Met Office-speak `changeable', was impressively dry and pleasant — indeed I'm told that Friday was positively hot.